Well, we’re in the thick of the summer, Mamas. I hope you’re having fun and checking items off the Summer Bucket List daily! But with August beginning, most of us (parents and kids alike) are already thinking about the upcoming school year. And if you’re like me and have kids like mine, you’re also worrying about how to make the transition to a new classroom and teacher as smooth as possible. Fear not, Mama. I’ve got you covered. I’ve got 5 tips and a great downloadable worksheet which will help you introduce yourself and your child to their new teacher, give the new teacher valuable input from last year and also give them a cheat sheet which is easier to understand than wading through the IEP folder they’ve been handed. Remember, the easier you make it for the teacher to interact with you and your child, the better the chances are for a great experience right from the start of the school year. While my first two tips are meant to be done at the end of the previous school year, it’s not too late to do them right now! Teachers are coming back to school in August, fresh from their break, but without a new set of kiddos yet. You can still get great input from them if you just ask. 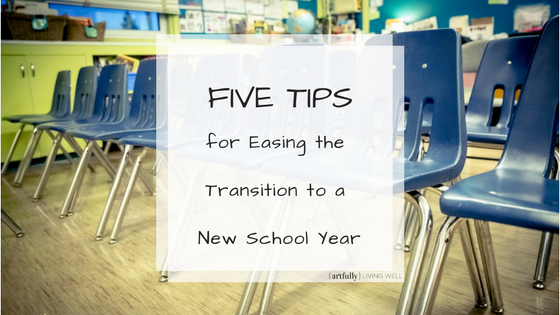 Read on to learn how to set your child up for the best transition to a new school year possible! 1. Ask the classroom and special education teachers if they will provide a quick note to the principal regarding the type of classroom environment and teaching style they feel would most benefit your child for the next year. Most school administrators try to balance this out for all their students, but a personal note from a staff member never hurts. Refrain from asking them to request specific teachers YOU want – they know their colleagues and your child’s learning style better than you do at this point. Hopefully, this note, coming from staff members instead of you, will carry some weight and steer the classroom assignment decision in the right direction. 2. 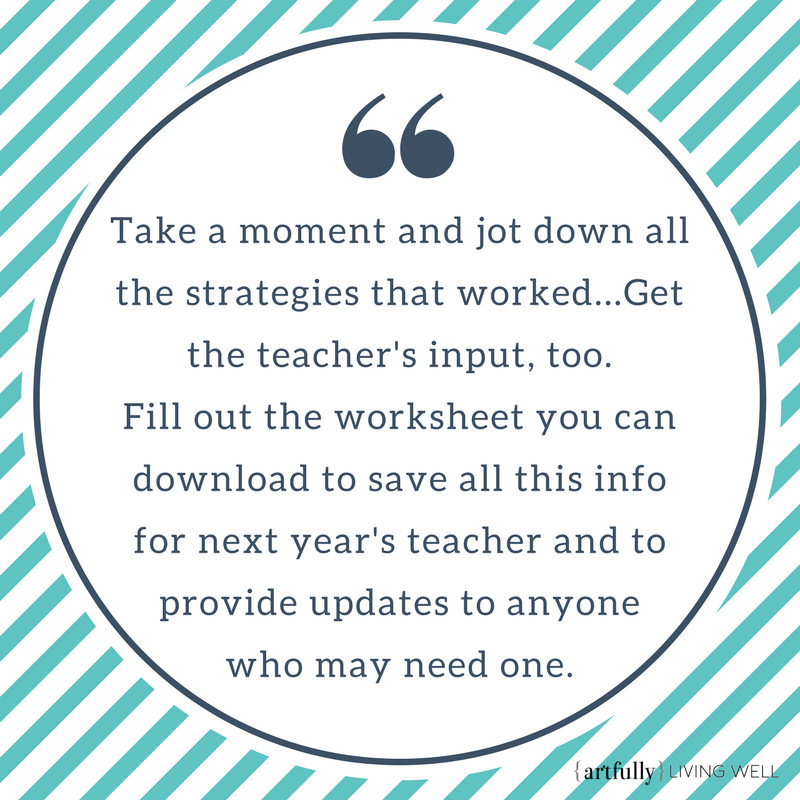 Take a moment and jot down all the strategies that worked for your child and their teacher. Get the teacher’s input, too, while it’s still fresh in everyone’s mind. Fill out the worksheet you can download HERE if you prefer to have a guide to work from. This will give you a resource to pass on to next year’s teacher(s). Don’t just rely on the IEP document – which we all know reads like a stereo manual (wait, does anyone have stereos anymore? Hmm….I digress) – to tell your child’s next teacher what she needs to know. Give examples of behaviors, what triggers are, how to stop the behavior from happening, warning signs, and how to deal with it afterward. In addition note any other coping skills your child used, like fidgets, being allowed chewing gum, using a standing desk, the ability to take a walk if needed, and if timed tests are better taken orally. You won’t remember all the details in 3 months, so take my word for it and do it sooner than later. 3. Keep up with some sort of academics over the summer. Workbooks, educational computer games, reading time, creative play…all these activities help them retain the information they learned last year and lets them know that life is about constantly learning. I sit down with my kids and while they do their math worksheets. While they work I read my current personal development book, taking notes right beside them, modeling that Mama keeps her mind sharp year-round, too. If your school has summer library hours, take the chance to keep your child familiar with the environment. Visit the library and ask if you can just walk the hall where the next grade’s classrooms are grouped. Ask your kiddo about the funniest or best memories they have from last year in the cafeteria/gym/library. Take some time to play on the playground. All this keeps the environment familiar and will help on the first day of school. 4. Once you finally find out who their new teacher will be just before school starts, then you can swing into action. I’ve always requested to know who the teacher is as soon as final decisions are made, but most likely you won’t know much more than a day or two before school starts. If your school has a sneak-peek day, ask if you can meet the teacher for 30 minutes – either earlier in the day or even right before everyone else shows up for some non-overwhelming one-on-one time. For my kiddos, especially when they were younger, being able to meet the teacher and get a feel for the classroom without being faced with new peers at the same time was crucial. After you’ve had a chance to chat with the new teacher, then you can email them the worksheet you downloaded and filled out. You can also ask to set up some time to chat without little ears listening in if you feel it’s necessary. 5. Finally, expect there to be bumps in the road as everyone gets used to the new normal. With each new grade, expectations will increase and growth is always a little uncomfortable. Remind your child that any anxiety they’re feeling is not only normal for their peers, but it’s exactly how you felt as a kid, too. Heck, tell them how you STILL feel awkward and unsure and even a bit confused and tired when you start a new job with new people and new rules and a new desk, etc. Ask them if they have any ideas on what they can do to feel better and let them know they can ask you if they need help coming up with a few more to try. The key here is to expect the bumps, know you’ve done everything you can, and support both your child and their new teacher as they work to create a new relationship on the foundation you’ve provided. I’ve used these five techniques in four different schools across multiple states, grades, and children. If you gather the input and insights while they’re still fresh, do all you can to keep your child in the school-mode over the summer, and insist on a bit of extra time to introduce your child to their new environment and teachers, I believe you can eliminate much of the tension around starting a new school year. You’ll be calmer, knowing you’ve done all you can do, and your kids will pick up on your emotional cues and be calmer as well. Remember, work to support the school in all they’re doing, all while making sure they’re doing everything they should in order to make your child successful! Joining my Mailing List! 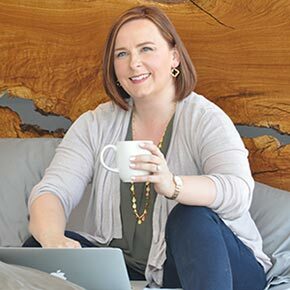 Leading up to the publication of my book in 2018, I’ll be publishing articles monthly to guide you through the process of assembling a great team to support your special needs child. Emails will be sent no more than monthly to let you know about the new article and any other resources I’ve learned about which may help make your life a little bit easier! 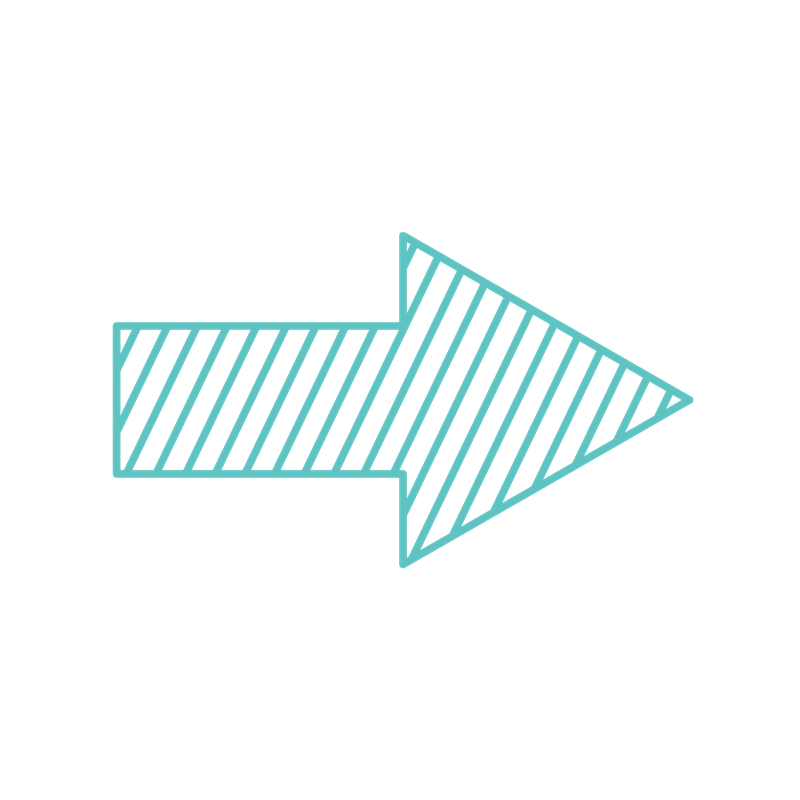 « Preparing for an IEP? Get Started Right!